Proof of Health Insurance (1095). 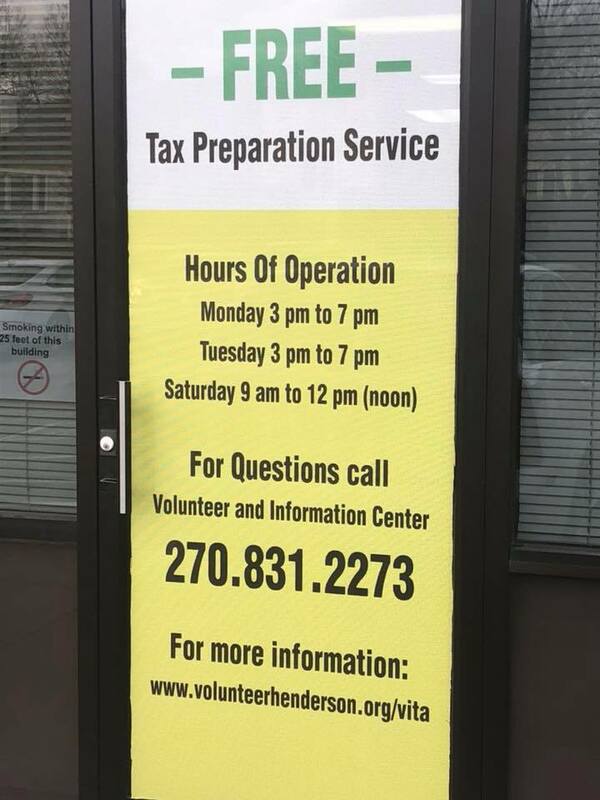 The Volunteer Income Tax Assistance Site is located at the Henderson Housing Authority, 111 South Adams Street. The site will be open on Saturday starting February 2, 2019, from 9 am to 12 pm and will remain open every Monday and Tuesday from 3 pm till 7 pm. Our site will coincide with the school schedule for inclement weather. Our last day of operation will be Saturday, April 13, 2019. We have an additional location at the Gathering Place (Senior Citizens Center), 1817 N Elm St. The hours will be Wednesday evenings from 5 pm to 7 pm starting Wednesday, February 6, 2019. We are looking for Volunteers to help with this program. To sign up to be a volunteer for the program call the Volunteer and Information Center office at 270.831.2273 or visit volunteerhenderson.org.